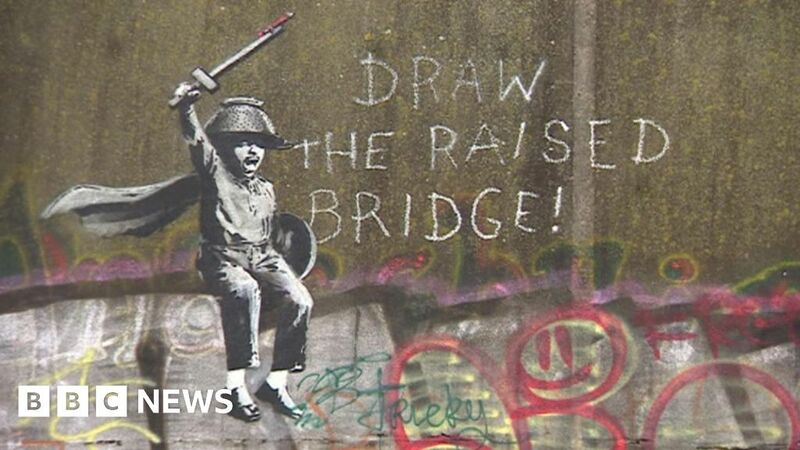 A mural believed to be by artist Banksy should be removed from a disused Hull bridge, a local councillor has claimed. The stencilled design depicts a child carrying a wooden sword with a pencil attached to the end. Images of the mural were shared on Banksy’s official Instagram account on Friday. Conservative councillor John Abbott said Banky’s work did not compare with “real art” in the city gallery. “I think that should be cleaned off. It should be photographed and the photograph kept because Banksy is not without talent,” said Mr Abbott. He said graffiti of any kind placed on walls should be removed. The elusive street artist posted two photos of the permanently raised bridge, situated on Scott Street in the Wincolmlee area. People have been visiting the area since news of the artwork was announced leading to the area round the bridge being fenced off. One visitor described seeing the mural “as a dream come true”. “I’ve followed Banksy’s work for many years,” he said. BBC Arts Editor Will Gompertz described Banksy as a “good artist and a genius PR man”. “I don’t think you can remove it,” he said.